﻿ Real Madrid 2-1 Valencia. 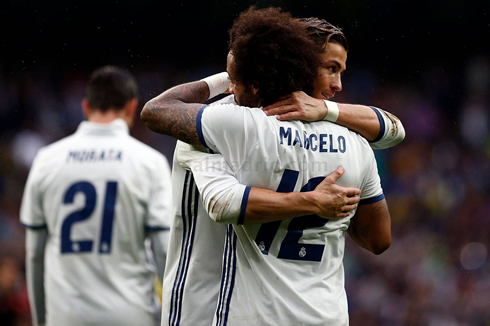 Marcelo comes to the rescue! 29.04.2017 » Real Madrid 2-1 Valencia. Marcelo comes to the rescue! Real Madrid survived another tough test in La Liga this Saturday afternoon, after hosting and beating Valencia by 2-1. Ronaldo gave the lead still in the 1st half, but after Valencia's equalizer in the 82nd minute, it would be Marcelo breaking the tie in the dying stages of the game and securing 3 vital points for the title race! 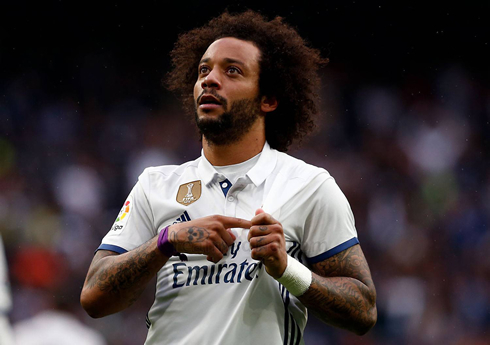 Everyone knows this Real Madrid team likes doing things the hard way and once again, the Merengues collected the 3 points at the Bernabéu after a heroic winning goal from Marcelo in the 86th minute of the game. Madrid walked over Valencia with a 2-1 victory, thanks to a first half header from Cristiano Ronaldo and that massive goal from Marcelo inside the last 10 minutes of the game. In between that, Parejo had tied the game up at 1 goal, thanks to a perfect free-kick that barely gave any chance for Navas to reach to the ball. 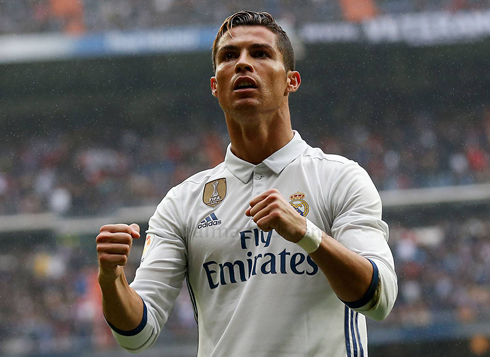 The game almost slipped away from Madrid's control, but as usual, it could have been settled way earlier if not for the penalty miss from Cristiano Ronaldo, who saw Diego Alves stopping it brilliantly. It's 3 out of 4 for the Brazilian against Ronaldo, and his 25 stop in 51 attempts in La Liga. Another game and yet, another late victory for Real Madrid. This season has been a nerve-racking season for all Madridistas. Whether it's conceding late goals vs Barcelona, or our own host of last minute victories, it's been an exciting season. Madrid's 2-1 victory today was massive and puts the team needing just four more wins to secure the league title. However, for much of today, the football on the pitch left a bit to be desired, further bolstering the claims that Madrid need to start playing some different lineups. After the massive 6-2 victory against Deportivo, Madrid brought back in the regulars in midfield and attack, with Casemiro, Kroos, Modric, Ronaldo, Benzema all starting. Sergio Ramos, fresh off his one-game suspension from El Clasico, was also back in the fold. Much of the game played out like most Madrid games this season so far. A lot of static play and a lot of passes to the wing. Carvajal and Marcelo were both excellent as usual, but it's so obvious that without the likes of Isco, Kovacic and Asensio that Madrid lack a lot of creativity in the center of the pitch. As a result, we were back to crossing, which works well for us and low and behold that's how the first goal would come. Another fantastic cross from Carvajal found the head of Cristiano Ronaldo, who headed home his 20th goal this season in La Liga. Early in the second half, Madrid had a chance to put the game away when Parejo was judged to have pulled Luka Modric back in the box. 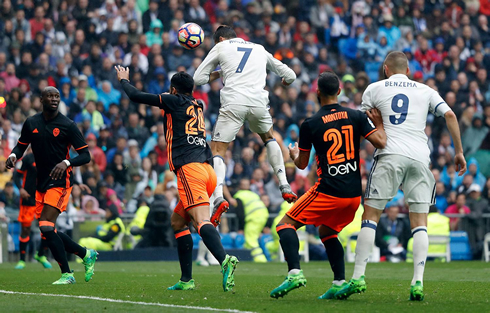 Ronaldo stepped up to take the penalty, but it was saved by Diego Alves. The Brazilian has now saved three of Ronaldo's last four penalties against him. Incredible! He also boasts a more than 50% record of penalty saves. However, just as they have been doing all season long, Madrid would lack the intensity to put the game away. There is an increasingly alarming lack of space between the midfield and the attack and with no one playing between the lines, Madrid find themselves going left to right far too often. There were a couple decent chances in the second, but nothing too fruitful and in the 82nd-minute things looked to be crashing down. A silly foul by Casemiro outside the box gave Valencia captain Dani Parejo a freekick and the former Cantera product placed it into the top corner. Navas tried to deflect it, but he didn't have the strength to push it wide as Valencia equalized. All of a sudden, La Liga seemed in doubt. But, with this team nothing is ever certain and with five minutes left it was none other than Marcelo scoring a fantastic right-footed strike after a Morata cross. The Bernabéu erupted and the title dream was still on. Madrid were able to hold onto the lead through the end of the match. Up next is Atletico Madrid for the Champions League and after Isco missed today's match, he's sure to start on Tuesday! At least, we hope so! Cristiano Ronaldo next game is a Champions League fixture, on May 2 of 2017 against Atletico Madrid. You can watch Juventus live stream, Real Madrid vs Atletico Madrid, Osasuna vs Barça, Manchester United vs Swansea City, Tottenham vs Arsenal, and Middlesbrough vs Manchester City, all matches provided from our football live streaming game pages.